Home - A community of independent schools, we explore and pursue exemplary leadership, training, research and international standards of educational excellence. In total 19 links were found which refer to Cais.ca. The most used keywords in text links are Canadian Accredited Independent Schools, CAIS and Canadian. Individual words like School, Logo and World are frequently used in text links from other websites. The most important link sources for this website are Bceducation.com and Bannockburn.ca. The homepage of Cais.ca and the subsite /page.cfm are most referenced by other websites. The table shows the most important links to Cais.ca. The table is sorted in descending order by importance. The table shows websites of Cais.ca, which are often linked by other websites and therefore they are classified as important content. 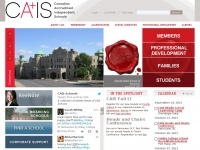 A profile of Cais.ca was found on the social network Twitter. The web server with the IP-address 162.222.96.33 used by Cais.ca is run by Access Northeast and is located in USA. The website Cais.ca has a own web server. The web server only runs this website.